Ever the leading man, actor Bradley Cooper took a moment to visit one of the Boston Marathon bombing victims in the hospital on Friday. 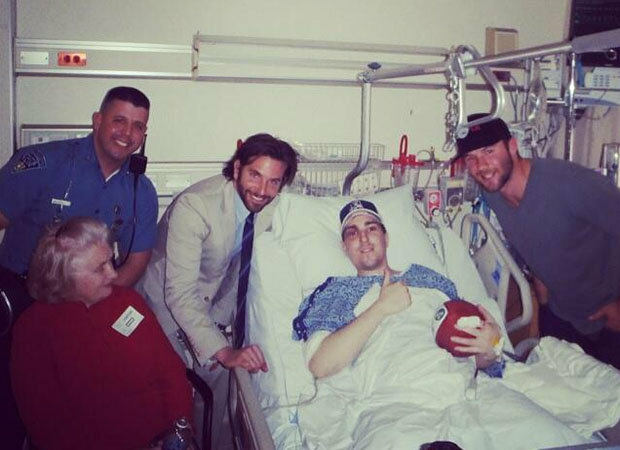 Jeffrey Bauman Jr., 27, who lost both of his legs below the knees in Monday's terrorist attack, was visited both by the "Silver Linings Playbook" actor and New England Patriots wide receiver Julian Edelman on Thursday. Bauman, who is from Concord, New Hampshire, was at the marathon to cheer on his girlfriend. His brother, Chris Bauman, said on Thursday that Jeffrey looked one of the bombers in the eyesjust before the explosion, likely helping the FBI to identify the suspects. "He woke up under so much drugs, asked for a paper and pen and wrote, 'bag, saw the guy, looked right at me,'" Chris said. Cooper is in Boston currently filming the new David O. Russell film "American Hustle," based on an ABSCAM sting operation from the '70s and '80s. The film also stars his "Playbook" co-stars Jennifer Lawrence and Robert De Niro, as well as Christian Bale, Amy Adams, Jeremy Renner, and Louis C.K. For the latest details on the hunt for the Boston Marathon bomber, head to the Yahoo! News Control Room.